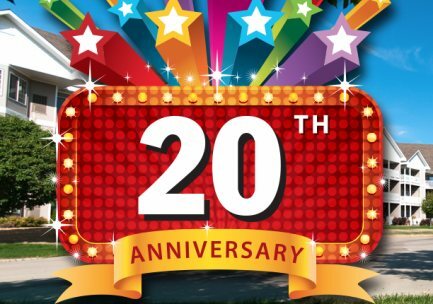 On August 11th, 2015, Trail Ridge Senior Living Community hosted a 20th Anniversary Celebration honoring the years of commitment and service Trail Ridge has provided to seniors and families in the Sioux Falls region. The family-friendly event took place onsite at the Trail Ridge community, providing attendees the opportunity to visit the recently completed $12 million redevelopment project. Included in the renovations are remodeled Independent Living apartments, 40 new Assisted Living apartments and a new Memory Care center, plus a state-of-the-art wellness center featuring a swimming pool, a cardio strength room outfitted with top-of-the-line equipment, a bistro and a new dining room. The event kicked off with an introductory address from Sioux Falls Mayor Mike Huether. Afterward, attendees enjoyed an outdoor picnic with delicious food prepared by the community’s renowned chef, Ryan Hembree. The popular band Mogen’s Heroes provided musical entertainment and there was plenty of kid-friendly activities as well. A charter luncheon was also held, honoring a number of original Trail Ridge residents. These residents shared how Trail Ridge has become their home and the changes they have witnessed over the past 20 years. Trail Ridge Senior Living Community is a not-for–profit and one of eight communities owned and operated by American Baptist Homes of the Midwest (ABHM) in Eden Prairie, MN. The community offers Independent Living, Assisted Living and Memory Care on an 18-acre campus located in the southwest area of Sioux Falls, South Dakota.